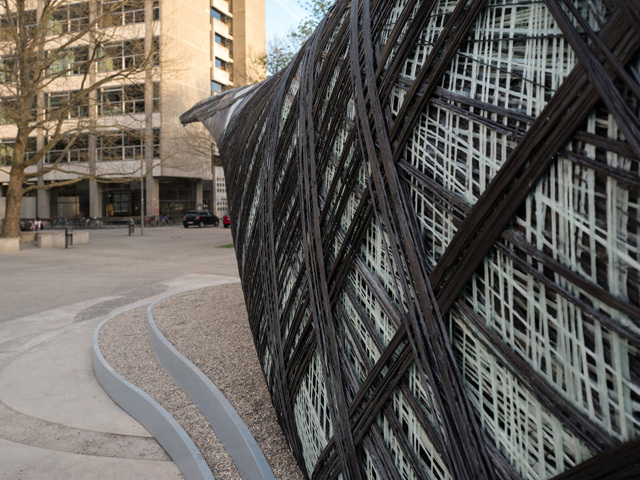 Researchers and students from the University of Stuttgart have used robots and drones to weave a public art carbon-fibre pavilion, which is based on the silk hammocks spun by moth larvae. 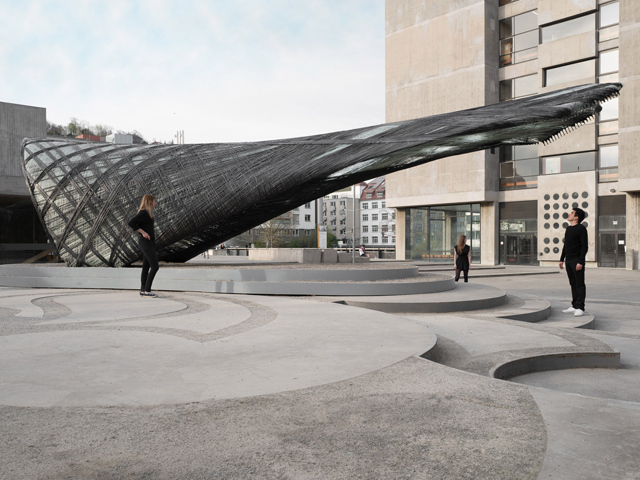 The 12-metre-long cantilevering structure known as the ICD/ITKE Research Pavilion 2016/7 is made from over 180 kilometres of woven resin-impregnated glass -and carbon-fibre. 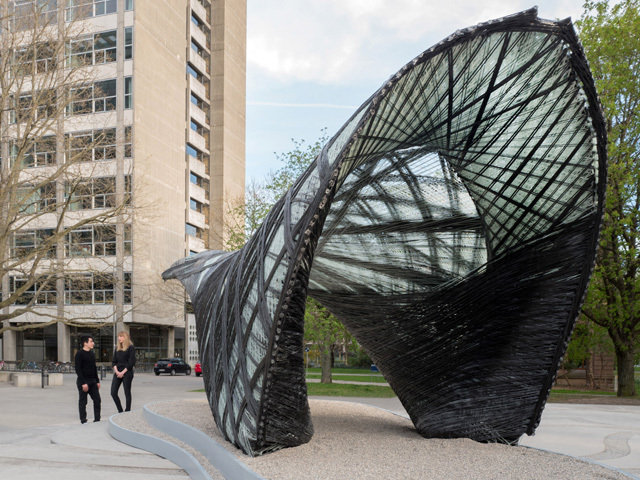 It is latest in an annual pavilion series built by students and researchers at the University of Stuttgart, which investigates the capabilities of carbon fibre as a building material by mimicking structures found in the natural world. 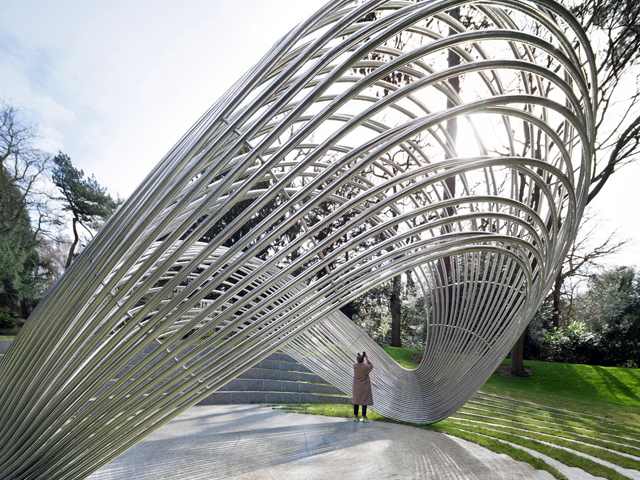 The pavilions are overseen by Achim Menges, who heads up the school's Institute for Computational Design (ICD), and Jan Knippers from the Institute of Building Structures and Structural Design (ITKE). This year researcher Marshall Prado also joined the team. 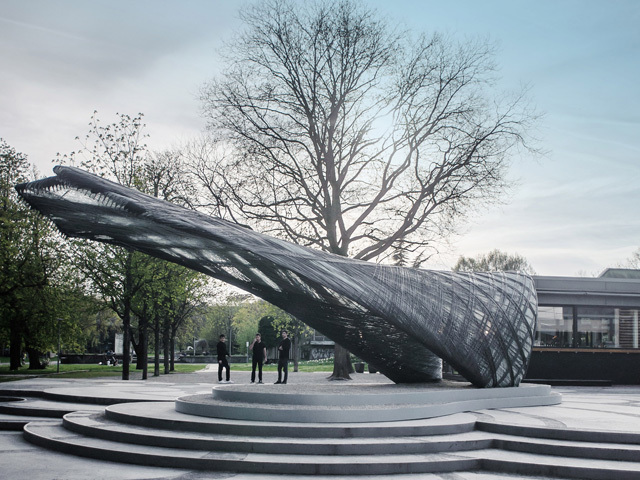 Finding the previous robotically woven carbon-fibre structures limited by the working space of the industrial robotic arms used, this year the team wanted to develop a method for making larger-scale structures. 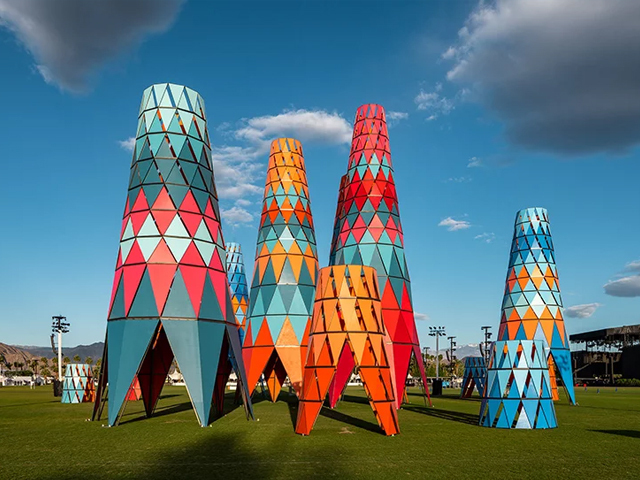 "Within architectural scale production, where material self-weight is of high concern for larger-span structures, lightweight fibre composites provide unparalleled performance," said the team. 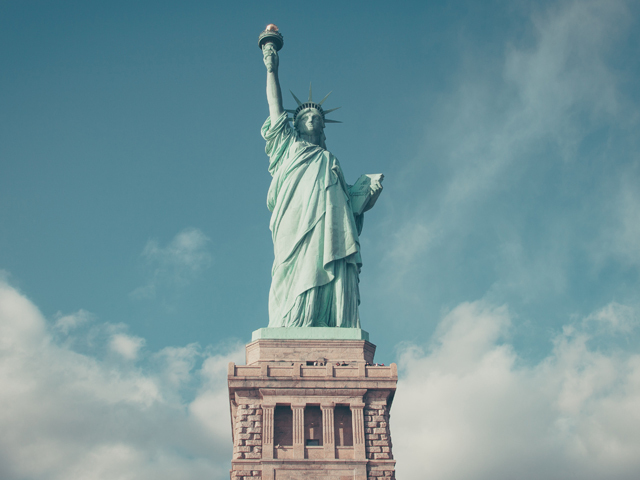 "We currently lack adequate fibre-composite fabrication processes to produce at this scale without compromising the design freedom and system adaptability required for the architecture and design industries," they continued. 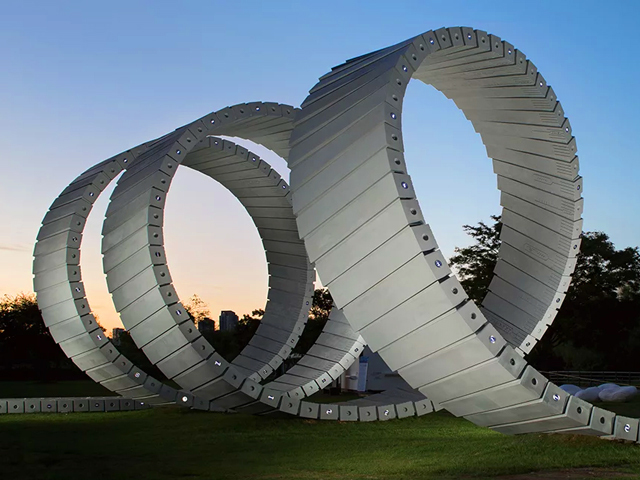 "The aim was to develop a fibre-winding technique over a longer span, which reduces the required formwork to a minimum, while taking advantage of the structural performance of continuous filament." 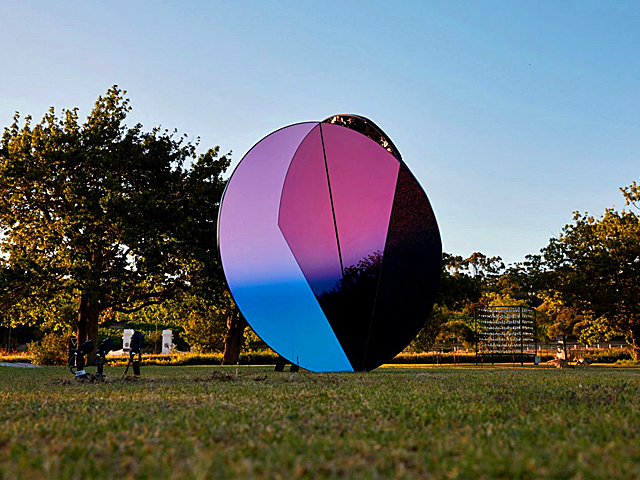 To create the long-span structure, the team combined strong and precise stationary robots with long-range drones. "In the specific experimental set-up, two stationary industrial robotic arms with the strength and precision necessary for fibre winding work are placed at the extremities of the structure," they explained, "while an autonomous, long range but less precise fibre transportation system is utilised to pass the fibre from one side to the other, in this case a custom-built Unmanned Aerial Vehicle." 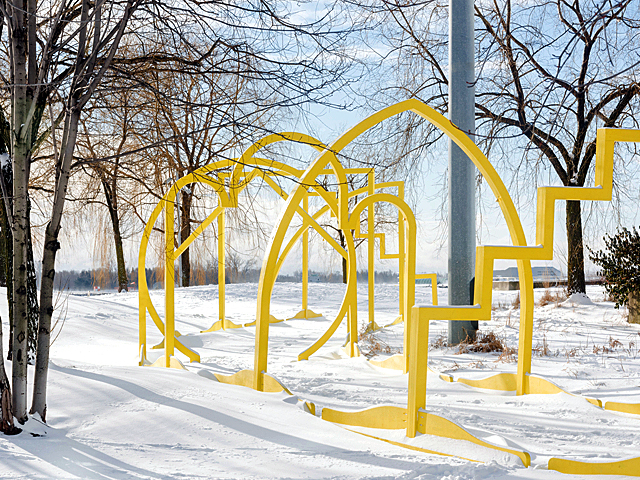 This new construction method could see our public art take on new and dramatic forms thanks to improved control over particular compositional materials.